Spring 2018 Judged Show is Saturday, May 19th, 2018 at South County Community Center, Lake Robbins Dr, The Woodlands, TX 77380. Click link below for more information! Note: If you are a newbie to this process, please reach out to the board members as soon as possible. We understand the first time can be a bit over powering. Please don't get discouraged, just open your heart and ask for HELP. We all have been in your shoes. The Lone Star Art Guild is a fine arts community organization currently made up of 18 independent art leagues located within a 200-mile radius of Houston,Texas. 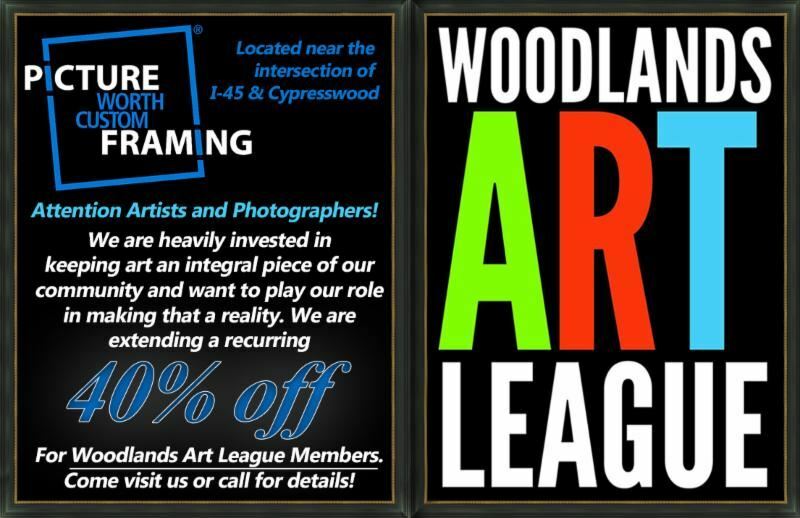 Woodlands Art League is a member. The judged art shows and exhibitions held by each of the LSAG member leagues and at LSAG's annual convention encompass all visual art mediums........painting, drawing, mixed media, photography, digital art, sculpture and studio fine crafts. Each year, LSAG member leagues offer workshops, lectures, demonstrations and exhibits to further their mission......to advance the study and dissemination of fine art in all of its forms by promoting the appreciation of art and fine craftsmanship. In addition, member leagues donate time, service and scholarships in the visual arts in their own local communities to further this mission.